Launch party weekend – a great success! This past Saturday was our official launch party! 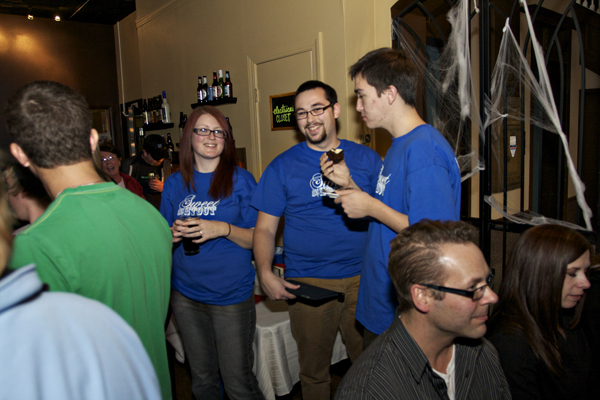 We wanted to celebrate a successful kickstarter campaign, and give our awesome backers their beer cupcake rewards. 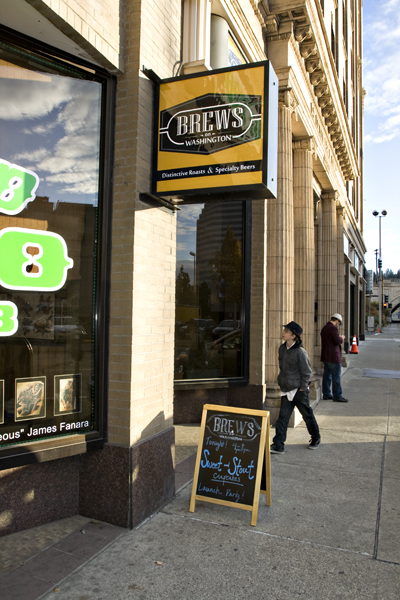 This was the event we’ve been working so hard towards, the day we introduced our beer cupcakes to Spokane! The Friday before the event was baking day (er… night). Luckily for Dylan and I, we had some helpers coming to town just to bake with us (and keep us from totally freaking out). Dylan’s mom, dad, and brother, all drove from across the state to help us out! We were so glad to have them too, we ended up baking around 170 cupcakes that night. Jackie and Dylan getting down to baking. I’ll tell you that the baking took a bit longer that night than we had anticipated, but it was also the second time we had ever cooked in the commercial kitchen. Many diet cokes, chocolate bars, pep talks and grocery store runs later, we left the kitchen victorious around 1:00 am (arrived at 7 pm). We arrived at Brews on Washington near 3:00 pm the next day, a little tired, but excited for things to get going. After carefully setting up some displays, beers were poured, and we eagerly awaited the arrival of our friends and guests. Spokane, you did not disappoint us! Shortly after 4:00, things got rolling! It was the coolest thing to see. We were both so excited to meet new people, including those who donated to us through kickstarter. It was great to finally meet a few people that I’ve come to know through twitter, too! Welcome sign out from of Brews. The cupcakes before the crowd arrived. 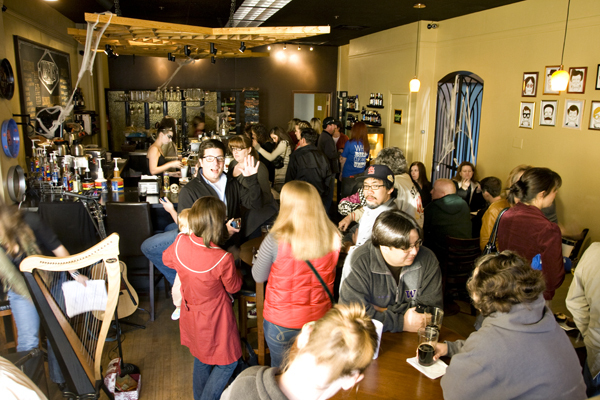 The crowd at Brews on Washington! Eventually, we had to move the cupcakes behind the bar because they were being sold too quick to keep up with the restocking! Jackie, Dylan and Dylan's brother, Morgan, at the kickoff party. We wanted to give a special thanks to Liz Rognes, for delighting our ears with her music throughout the event. I had plenty of people come up and tell me not only how great the cupcakes were, but how great the music was! We both would also like to give a very special thank you to Dylan’s family for driving all the way from the west side of the state to help us! Their help was greatly appreciated. Plus, all the photos you see above were shot by Dylan’s dad, Martin, who own Photos by Martin based in Bellingham, WA. He does great work, and we are so thankful that he was there to capture these great images! Carolyn and Martin, our veteran frosters! Really, thank you to everyone that came out. We had an amazing and memorable night, and it’s all thanks to you! 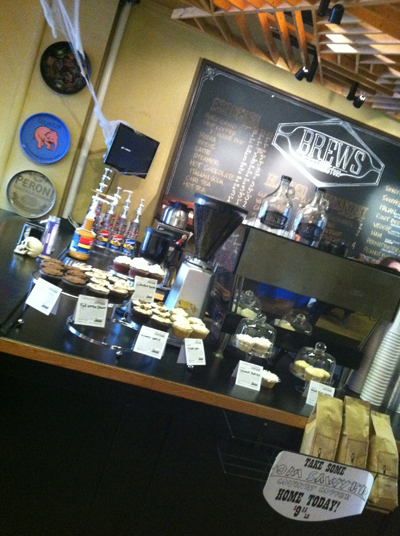 We hope you’ll be back to Brews to have another cupcake soon. 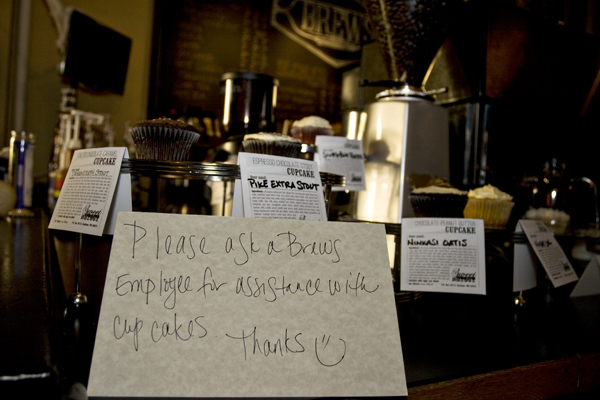 We’re working on getting our cupcakes out there to more venues, so stay tuned for that news. Also, we’re going to open up to taking orders, directly from us, if you would like 2 dozen or more. As the week goes on, I’m hoping to have a little more information here on our website about placing orders, and the flavors we’ll carry. Of course, I’ll keep everyone updated on our progress. We need your help [please]! We’re nearing the finish line! The end (or, really, the beginning) is in sight. Have you heard of kickstarter.com? Well, if you haven’t, it’s a platform people use to raise money for a wide variety of projects. 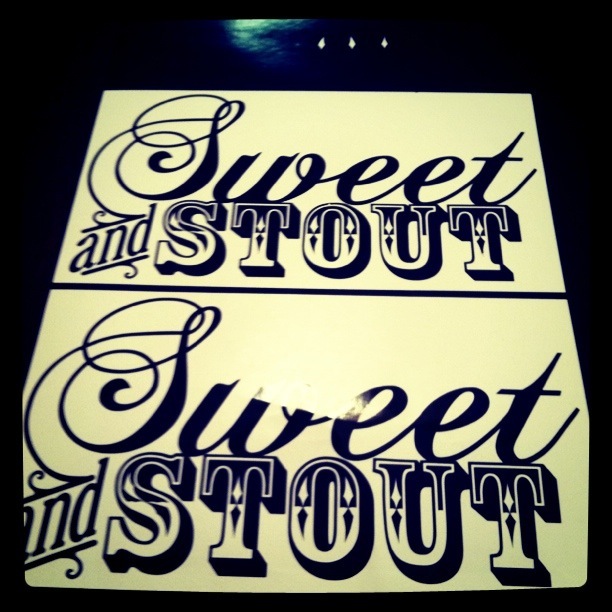 Dylan and I have created a project for Sweet and Stout, and we’re hoping you’ll stop by our page and check it out. Sweet and Stout has become more than just a blog, and with your help, we’ll be off and running sooner than we would be able to do by ourselves. At least stop by and check out the video we made. It took a lot longer than we thought it would to create. (and a lot more curse words than originally anticipated) When this is all said and done, I think we’ll post some of the video clips that were a little too “colorful” for the final cut. Sitting in front of the camera was one of the hardest things I’ve had to do in a while. I think Dylan does a lot better on screen. I’m definitely more comfortable behind the camera, but I’m hoping we got our message across. Make sure you check out our donation rewards too, they’re pretty awesome. We’re going to be getting custom pint glasses made from Custom Printed Beer Glasses, a local company here in Spokane. Our friends, John and Angela Gordon, have helped us out and made us some really cool vinyl stickers to give away. Also, we’ll be getting t-shirts made by Blue Button, a local non-profit screen printing company. Oh, and probably the coolest prize (if I do say so myself), will be an invitation to our launch party! The invite also includes 2 free cupcakes while you’re there! Yum. Click here to go to our kickstarter project. We want to thank everyone we’ve met along this journey of beer-cupcake exploration. Without your support, we couldn’t have made it this far. Please consider helping us to the next phase of our plan. When someone asks “Where can I buy one of your cupcakes?”, I’d love to be able to tell them. We are so close, and you can help get us there. It all started with a dream that Dylan & I had. One day we would like to start a brewery making all kinds of hand crafted beer. The location of our brewery changes with our moods. Sometimes we’d like to stay in Spokane and buy up an old warehouse downtown. Other times we’d like to move over by the ocean to a small town, like a tourist destination, buy an old firehouse and open up a pub/brewery there. Every time we dream about it, we come up with even better ideas for it. So then this light bulb lit above my head and I thought “This really is a great idea, why don’t I do something about it?”. So I tried to get Dylan to start brewing some beer, but it is a little bit of a start-up cost to making beer and that has put a small hold on our dream. Not easily discouraged, I came up with an amended version of our plan. I stumbled upon a recipe for a chocolate cupcake made with a stout beer which sounded really interesting. I wondered how it would taste if I made the chocolate stout cupcakes and then paired it with the stout I had used to make it. As it turns out, they tasted pretty darn great together. So in the meantime my plan is this: I will explore the world of baking cupcakes, be it with or without a beer in the recipe, and I will pair them up with different types of beer for maximum enjoyment. This is going to be great silly fun!